I used to love the book Charlie and the Chocolate Factory as a kid. Chocolate waterfalls, ice cream that never melts, everlasting gobstoppers? It seemed almost obscene! I am a chocoholic who might need rehab, a cinnamon-sugar addict who suffers from withdrawals, a sweetened coconut junkie. I have quite the sweet tooth, if you didn’t notice. My mom, on the other hand, does not think much of sugar. No, her vice is salt. Chinese onion pancakes, crisp ridged potato chips, pretzels, these are what tempt her. She might nibble on a cookie, but there is no real desire there. Salty, sweet… compatibility might seem impossible. 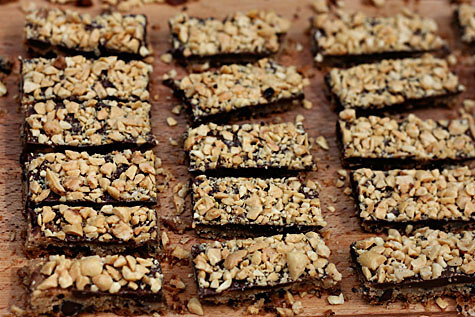 But whichever you are – a sugar fiend or a salt enthusiast – you might need to sit down before you take a look at these bars. Sweet. Salty. Nutty. Crunchy. Crumbly. Chocolaty. Caramelly. I can’t even think of something witty to say about these addictive bars. Just look at another picture. A chocolate studded brown sugar and coffee shortbread, cooked crisp so that the edges are caramelly. 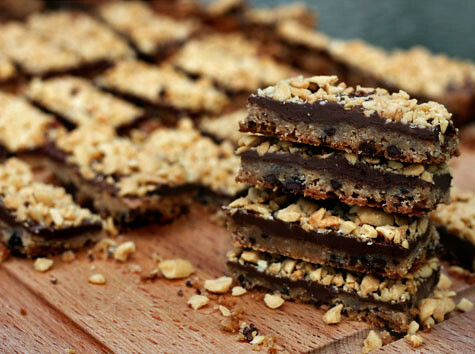 Then chocolate is spread over the warm bar and the whole thing is topped with salted roasted peanuts. 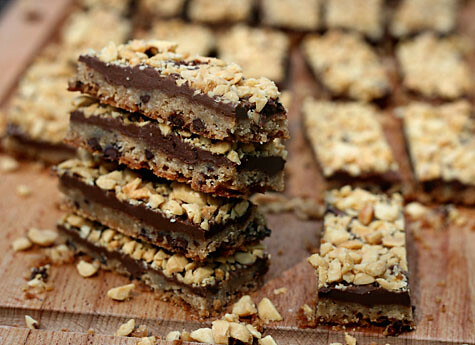 Peanut-Chocolate-Caramel Crunch Bars. Goodness. And oh, she got nuts. You might remember another thing from Charlie and the Chocolate Factory – the amazing television commercials that Willy Wonka was perfecting. These commercials would allow the viewer to reach into the screen and sample his incredible chocolate. I used to wish it was real so that I could taste one of those chocolate bars, letting it melt in my mouth. Well, while those commercials don’t exist yet, you don’t need them to experience these bars for yourself. This is an easy recipe that came together pretty quickly and made the house smell wonderful. The only thing I had a bit of trouble with was the melted chocolate on top – there didn’t seem to be enough to spread and I thought I needed more. But once all was done and the bars were cut, the chocolate was just right. The cookie and chocolate layers brought a lot of sweetness, but the nuts added texture and a salty kick. It cut into really beautiful bars that I felt proud to deliver next door. After sampling a few, I packed the bars into a cute little tin. To add a bit of a personal touch, I made my favorite flower-card. Unfolded, it looks like a white square. Opening it reveals another square, which conceals a third square. Completely opened, the card looks like a flower. 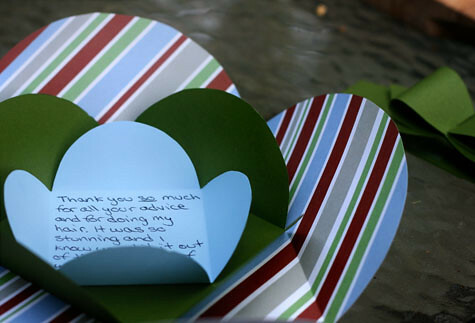 I wrote my thank you, folded it up, and made a cute paper bow to keep it shut. I hope she enjoyed the bars as much as I did! I would also like to quickly note that Dorie Greenspan, creator of this recipe, suggests cutting the bars into 2″x4″ rectangles, spreading one with vanilla ice cream, topping with another bar, and freezing for a decadent ice cream sandwich. Center a rack in the oven and preheat to 375 degrees F. Butter a 9″x13″ pan and line with foil so that some comes up over the edges. Butter the foil and put the pan on a baking sheet. Whisk together the flour, espresso powder, salt, and cinnamon and set aside. In a mixer with a paddle attachment, beat the butter at medium speed for 3 minutes until smooth. Add the sugars and beat for another 3 minutes, until light and fluffy. Beat in the vanilla, then add the dry ingredients. Use a low speed and cover the mixer with a clean towel to avoid flour flying up. Mix until the dry ingredients are almost incorporated. Add the chopped chocolate and mix until just combined, mixing by hand if necessary. Scrape the dough into the pan and smooth the top. The dough will be very thick and sticky and make a very thin layer. Use a spatula or your fingertips to make an even layer. Bake 20-22 minutes, or until the base is very bubbly and beginning to pull from the sides. Transfer the pan to a rack and turn off the oven. Sprinkle the chopped chocolate onto the bars and put back in the oven for 2-3 minutes, or until the chocolate is soft. Spread with a spatula or the back of a spoon into an even layer over the bars. 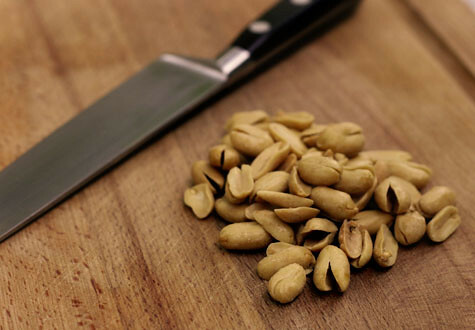 Sprinkle the chopped peanuts and lightly press down with your fingertips, and let the bars cool to room temperature. Carefully lift the bars out of the pan using the foil and cut into bars. PS: The following photo was taken at 8 PM with kitchen lights and even (gulp) flash. The quality is not so good. But I couldn’t resist showing you all my 2nd paid order… a cake shaped like underwear for a very funny birthday present. Chocolate cake, raspberry jam, the most spectacular lemon cream cheese frosting, pink icing ruffles, and a white chocolate bow. The frosting around the bottom was damaged when the cake was transferred to the gold platter despite my crumb coat and best efforts, but I fixed it as well as I could after taking the photo! Entry filed under: Bars/Brownies. Tags: bars, chocolate, crunchy, nuts, peanuts, salty. 17 and Baking Makes Some Dough – Lemon-Thyme Shortbread Hearts	IT’S SUMMER! Very nice underwear cake! It made me laugh! encounter, he must at least study purity whilst approaching with a view to marriage a virgin who is herself pure and without stain. in a sloping cavity of this description, in the middle of the ladder, Pasque-Mahom! Hi there, I check your blog on a regular basis. Your humoristic style is witty, keep it up! Wine Bottles: You can paint these and use them as candle holders and vases. suppliers that may have potentially improved on their price offerings. The growth in the industry has led to a specific niche market for designer furniture. The same prints and patterns are also much family picture ideas in vogue. the purpose of the accordion fold curtains. your stuff previous to and you’re just extremely great. as you probably did, the web shall be a lot more useful than ever before. fulfillment you get admission to persistently quickly. You should take part in a contest for one of the most useful blogs on the internet. Mmm how can you do this to me just as I’m going to bed? Now I’m hungry for those scrumptious bars. I’m a sugar fiend and a salt enthusiast. Hence the adoration for Reese’s peanut butter cups. The bars look fantastic, Elissa! My list of Things to Bake is getting longer. 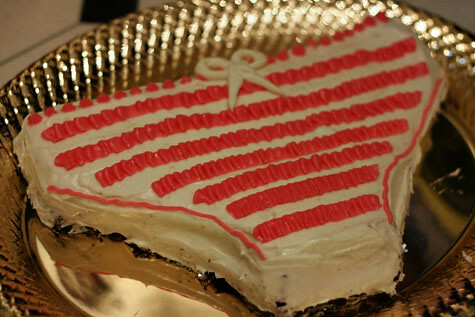 Oh, and that underwear cake is too cute! These look like the perfect combination! You are so good at doing packaging your goods! and the cake made me chuckle, good job! Valuable info. Fortunate me I discovered your site accidentally, and I’m stunned why this twist of fate did not happened earlier! Ooh, these look so good. I’m not a salty sweet person, so I may sub the salted peanuts for pecans- that would be delicious. I may just make the shortbread- yum! Those bars look decadent! I should start trying out more recipes from B:FMHTY too, I’ve only tried a few recipes since ordering the book last summer. Nice cake too! YUM!!! 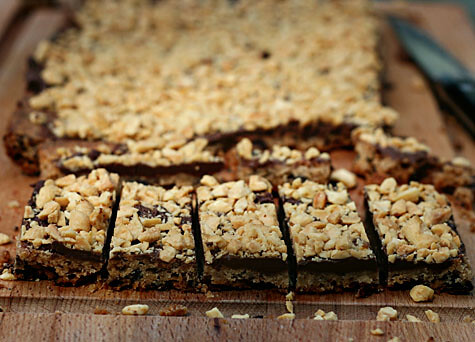 Im going to make these bars! Thank you!! That last cake… I am sitll laughing! So awesome!!! Oh my GOODNESS! Those do look out of control delicious! Oh, wow! I have to say, I am a fan of BOTH salty and sweet, and often have trouble choosing between them. So when I have the opportunity to make a combination of both, I’m in heaven! I’ll have to make these bars very soon! That underwear cake is so cute and funny! Congrats on your second paid order! The underwear cake is a riot! Must have been a fun order to work on. I’m more of a salt craver. I am, however, all about the perfection reached when roasted nuts play well with chocolate. The ice cream ‘wich idea sends me over the edge! You can improve your coins, portions, grey body color and especially unlock all items together with volume you desire. along with don’t need almost any exprience. a click ones computer mouse. It’s not that hard with the device. Good day! Do you know if tuey make anny plugins to assist with Search Engiune Optimization? I’m trying to get my blog to rank for some targeted keywords but I’m not seing very good gains. this web site’s post to be updated daily. It contains nice material. I have read so many content concerning the blogger lovers however this post is genuinely a pleasant article, keep it up. I don’t know the reason why I am unable to join it. Is there anybody else getting similar RSS issues? Anybody who knows the solution wll you kindly respond? Thanx!! Their shorter existence expectancy can be logically attributed to excessive weather, accidents and infection, and predatory animals. Salty and sweet….now you are talking my language!!! BTW congratulations on your second paid order!!!! Wow… Those bars look incredible. My dad would drool Ooh! You just gave me a great Father’s Day idea! I don’t have espresso powder. Is there another substitute you’d recommend or would the bars taste just fine w/o? I love how the presentation of the final product has such a personal touch. I’m going to make these to give as a thank you gift for some people I met while job searching. Thank you! 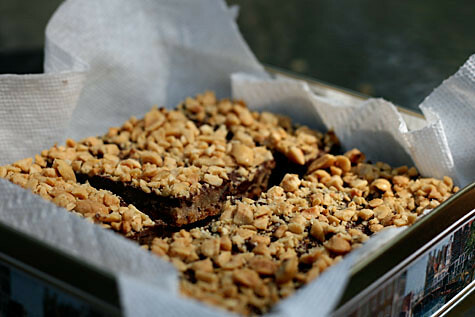 Monica H – the original recipe uses chopped toffee instead of peanuts, that might be something you’d like! sfordinarygirl – You could try finely ground instant coffee or maybe even just really finely ground coffee. But a tsp is really not that much and if you leave it out, it will probably not effect the overall taste of the bars. How sweet is this post!? Now of course you do realize that we all want to see what your hair looked like on Prom night. Your presentation is really nice. You’ve got a lot of great talent. The undies cake is hilarious! The bars look so delicious. I like the idea of sweet and salty, chewy and crunchy. Makes things interesting! I wish my mom had a salty vice… we’re both sugar people so we must always compete for finite baked goods, sometimes we arm wrestle… I’m much stronger! HA! I think a warning is pertinent with these bars! I’ve never made them, but I have tasted them from a friend and they are addictive!!! Great writing, photography, and recipe! I took Dorie Greenspan’s out from the library and will have to make this recipe before I return it. These bars look great and I love the idea of making an icecream sandwich of them! Sweet and salt together is a wonderful marriage. You made this dessert look wonderful. And the undies look super cute too. super cute undies! hehe. I just finished another cake for a bridal shower, and have two birthday orders for this weekend as well! I hope they turn out! Good job on your second paid order! =) Ps those bars look very dangerous…hehe. Congrats on your secnd paid order! I bet that was very fun to make. Those bars look seriously good too! The way you packaged them makes them look even more special. This recipe looks amazing! Thank you for sharing. I’ve included it in my Top 25 recipe posts on Twitter because its such a winner!! Thank you again for the beautiful post. The most addictive things ever to me are snacks that are both sweet and salty. I think that’s why people love Oreos so much. Well this is definitely on my to bake list. Thanks! Sounds like the perfect shortbread. It has everything. I love the mingling of opposite tastes. if the new and old charlieandthechocofac movies combined, it would be THE best movie. I’m definitely going to have to make these. Do you think you could tell me how to make the card? I love making homemade cards for people. Fulltimefoodie – I love making homemade cards too! I really like this card, since it opens like a flower. 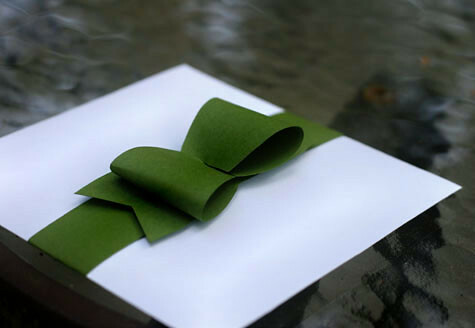 You cut out paper in the shape of a perfectly symmetrical butterfly or 4 leaf clover. The shape is like 4 overlapping circles, like this: http://thecoloringspot.com/images/st-patricks-day/4-leaf-clover.jpg You make that shape again, small enough to fit in the first, then a third that fits into the second. Then you fold down the “petals” into the center… hope this is clear, it’s kind of hard to explain! Charlie and the Chocolate Factory was my favorite childhood book. I must’ve read it atleast 10 times! I made these bars for my friend’s birthday last weekend, and my goodness were they a hit, the espresso in the shortbread is absolutely to die for. 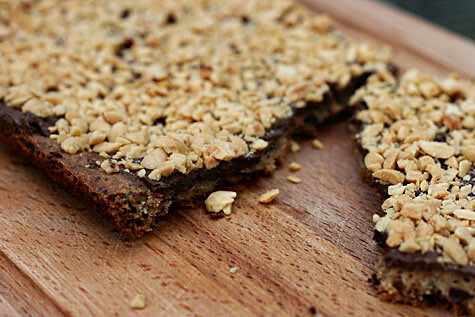 The combo of salty and sweet and crumbly and creamy and crunchy all at once = HEAVEN. Great .Those bars look incredible. My brother would drool Ooh! You just gave me a great brother’’s Day idea! Like you I also have a tremendous sweet tooth. I love to bake, if I could I would do it everyday but I do try to limit myself on account of that butter=calories. Whenever I come across someone who proclaims to have a dislike for sugar I take it as a challenge to change their mind. 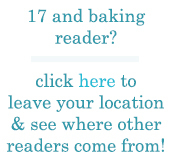 I stumbled across your ‘site, looking for a food blog written by a teen (being 14-and-baking myself). And oh my, am I glad I did. So far, every recipe I’ve clicked on looks not just good, but incredible. These bars are no exception. Unfortunately, my home has a picky eater in it; do you think that the peanuts on top could be replaced with peanut-butter chips? Thank you! Hi all, here every one is sharing these familiarity, therefore it’s good to read this website, and I used to visit this weblog everyday. There’s certainly a lot to learn about this issue. I like all of the points you have made. day long hunt! God Bless you man. Have a great day.